The Geological Survey of Japan (GSJ) has published 1:200,000 Marine Geology Map of the Vicinity of Southern Okinawa-Jima Island. The authors (Kohsaku Arai, Takahiko Inoue, Tomoyuki Sato, Hirokuni Oda, and Takuya Itaki, Research Institute of Geology and Geoinformation) have conducted detailed geological survey in the surrounding ocean area and revealed that the northern and southern halves of the island have different geological histories because the island was bent in the middle before 1.6 Ma. Fig. 1. 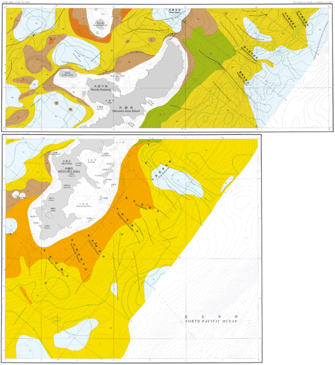 Marine geology maps around Okinawa-Jima. The lower has been published this time. A thick layer of a submarine group corresponding to the Shimajiri Group on land, in which water-soluble natural gas is expected, is widely distributed in the southern offshore, while it is not deposited on the shelf edge in north. This is considered to have resulted from the fact that the Okinawa Jima was curved in the middle about 6 Ma. A fore-arc basin, where this thick layer deposited, dominantly developed off the southern half of the island by the subduction of the Philippine Sea Plate and activity of Okinawa Trough, and its depositional environment was different from that in the north at that time. Then the southern half moved to the present position later, located in the same depositional environment as the northern half. The map not only provides important information for resources development but also is expected to be useful for disaster mitigation and utilization of the ocean. The map is available from commission agents. For details, see the URL below.